USC researchers have discovered that transfer of vital genetic information within a cell isn’t the one-way telegraph once thought, opening new pathways for understanding human disease and developing potential treatments, a new study shows. Research conducted by scientists at the USC Leonard Davis School of Gerontology is the first to show that the mitochondrial and nuclear genomes co-evolved to independently cross-regulate each other. Understanding how intracellular DNA communication is hardwired into the cell will lead more researchers to appreciate the coordination of genes encoded in both genomes and their role in aging and disease, said Changhan David Lee, assistant professor of gerontology at the USC Leonard Davis School and senior author of the study. The findings are significant because aging causes cells to break down, leading to diseases such as cancer and Alzheimer’s. Understanding the cell’s inner workings opens opportunities for medical advances that can help save lives. The study appears today in the journal Cell Metabolism. Knowing intimately how cells operate could lead to greater understanding of age-related disease and, perhaps one day, new mitochondria-based treatments. Prescription drugs today are designed based on the blueprint encoded in the nuclear genome, scientists say. The field of intracellular communication is relatively recent — emerging and accelerating in the past decade. As medical equipment becomes more incisive, scientists can better detect small things, so even tiny genes inside a cell get more study. USC researchers focused on the two parts of the cell that carry DNA: the nucleus and the mitochondria. Most genetic material resides in the nucleus, which is the largest component of the cell. Its DNA sends coded templates telling the cell what to do. Smaller mitochondria function as energy-producing factories, turning food into fuel to power the cell. But size can be misleading. The mitochondria also contain DNA, all of it inherited from the mother, and as the new study shows, they are not just taking orders from the nucleus. 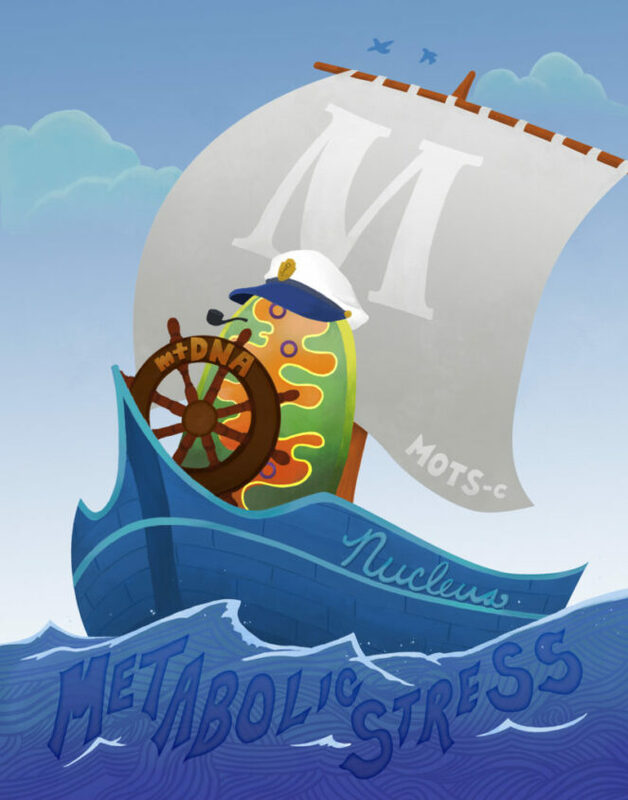 Working with human cells, the scientists discovered that when a cell is under stress and starved for nutrients, MOTS-c, a small protein encoded in the mitochondria DNA, moves into the nucleus to control genes and turn on a defensive system, including an antioxidant response. “Most diseases are due to aging, and aging leads to a breakdown in cell functions,” Lee said. “When things go wrong in the body, it’s because some mechanism in the body went wrong. So, understanding how cells age means we have more insight into how the damage occurs and how we can prevent or fix it,” he said. USC Leonard Davis School is the locus for collaboration in basic and applied research in aging across the university. Researchers collaborate to solve aging challenges from diverse disciplines, including neurobiology, molecular biology, biodemography, cognitive psychology, sociology, urban planning and health services. It also focuses on aging-related issues such as family studies, housing, long-term services and support, fall prevention, elder abuse prevention, caregiving and technology. The study authors include lead researchers Lee, Kyung Hwa Kim, Jyung Mean Son and Bérénice Benayoun of the USC Leonard Davis School, USC Norris Comprehensive Cancer Center and USC Stem Cell Initiative. Lee is a consultant for, and a shareholder of, CohBar Inc., which is based in Menlo Park, Calif., and conducts research and development of mitochondria-based therapeutics. The work was funded by grants from the National Institutes of Health (R01AG052558), the Ellison Medical Foundation, the American Federation for Aging Research and the Hanson- Thorell family to Changhan Lee and National Institutes of Health grant R00AG049934 to B. Benayoun.